Transitions between two input clips using animated edge rays. The clips dissolve into each other, and edge rays are added to the result. The edge rays ramps up and down over the duration of the effect. The edge rays animate by moving the origin of the edge rays across the screen along a line. The Dissolve Amount parameter should be animated to control the transition speed. Dissolve Amount: Default: 0, Range: 0 to 1. The transition ratio between the From and To inputs. A value of 0 gives only the From input and a value of 1 gives only the To input. By default this parameter automatically animates from 0 to 1 to perform a complete transition. The curve controlling this parameter can be adjusted for more detailed control over the timing of the dissolve. In the AVX1 version, Auto Trans must be disabled for this parameter to be used. Dissolve Speed: Default: 3, Range: 1 or greater. The speed of the dissolve between the From and To clips. 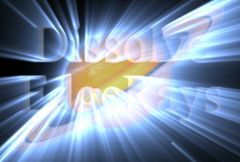 When set to 1, the dissolve takes place over the entire duration of the effect. When set higher, the dissolve is shorter, although the edge rays ramp-up and ramp-down still takes the entire duration. Setting this to 10 can make the transition snappier and more like a flash-frame cut. Rays Center: X & Y, Default: screen center. The location from which the rays beam outwards at the midpoint of the transition. Rays Center Speed: Default: 0.2, Range: 0 to 2. The speed at which the rays center moves across the screen. Rays Center Angle: Default: 0, Range: any. The angle at which the rays center moves across the screen. Rays Length: Default: 0.75, Range: 2 or less. The maximum length of the rays at the midpoint of the transition. Rays Shrink: Default: 0, Range: 0 to 1. The fraction by which the length of the rays is reduced at the beginning and end of the transition. Rays Brightness: Default: 8, Range: 0 or greater. The maximum brightness of the rays at the midpoint of the transition. Rays Fade: Default: 1, Range: 0 to 1. The fraction by which the rays brightness is reduced at the beginning and end of the transition. See general info for: Crop/Transform , Resolution , Clamp Output To Legal , Bypass Effect , and Reset .